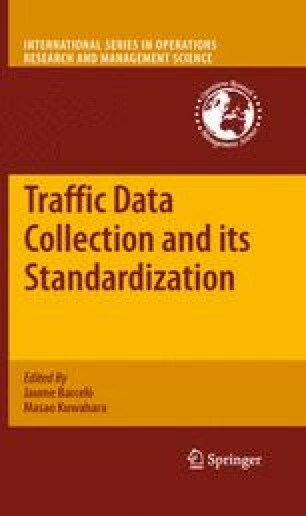 Driving behavior observed at traffic networks varies considerably depending on the type of road section. At signalized junctions, drivers are taught to moderate their speed, and to comply with the priority rules set by the traffic light. Therefore, vehicles stop and queue up during the red phase, and they leave the junction during the green and amber phases. During these operations, vehicle driving patterns vary significantly. The way they decelerate, stop at the back of the queue and accelerate changes from driver to driver. Aggressive drivers may show to operate stronger accelerations and to respond more quickly to the right-of-way signal. During the amber phase, some aggressive drivers accelerate to clear the intersection faster, while risk-averse drivers may decide to decelerate earlier, or even brake hard to avoid passing the stop-sign after the start of the red phase. Moreover, the observed trajectories will depend on whether a queue is actually present and on its length, as well as on the road characteristics, e.g., how clear is the view upstream of the junction, whether one or more lanes are dedicated to a traffic stream, etc. Therefore, individual vehicle trajectories are found to be highly variable at signalized intersections, as individual speeds and speed variations have strong dynamic and stochastic patterns. In applications that require accurate estimates of vehicle driving modes, like when estimating concentration levels of emissions, it is fundamental to provide realistic estimates of these trajectories, and, more importantly, to derive, from these trajectories, realistic speeds and speed variations. The authors would like to thank Minwei Li, Janneke van Baalen, and Jie Li for the contributions made within this project. This project is funded by TNO, Delft University of Technology, and the TRAIL Research School (project name T3).